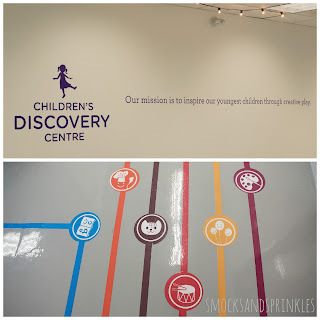 With all the chitter chatter going on about the opening of the Children's Discovery Centre in Toronto, we had to go check it out for ourselves. 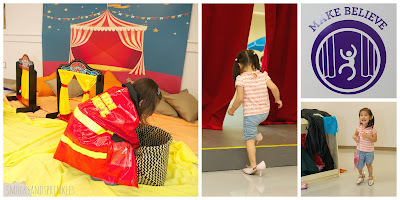 It is specifically designed for children 6 years of age and under and is open daily from 9:30 to 4:30 (holidays included!). We headed over on a Thursday, just after lunch. It wasn't busy at all! Where do we even begin!? This place knocked our socks off (if we were wearing socks...oh and speaking of socks, the infant areas require you to remove your shoes and wear socks. Lucky for us clean socks were available at no extra charge). Our toddlers (2.5 and 3 years of age) were begging to go back and even gave it a higher rating than the Science Center or ROM. 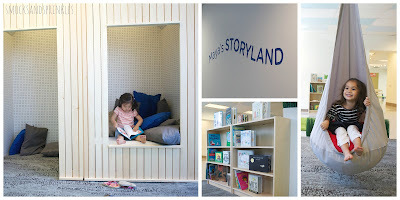 Can't say we blame them; this place is kid heaven. It truly allows their imaginations to run wild. They played nonstop for 3 hours straight and could easily have kept going. The space is expansive, modern, bright and airy. Inspirational child quotes pop off the clean white walls. 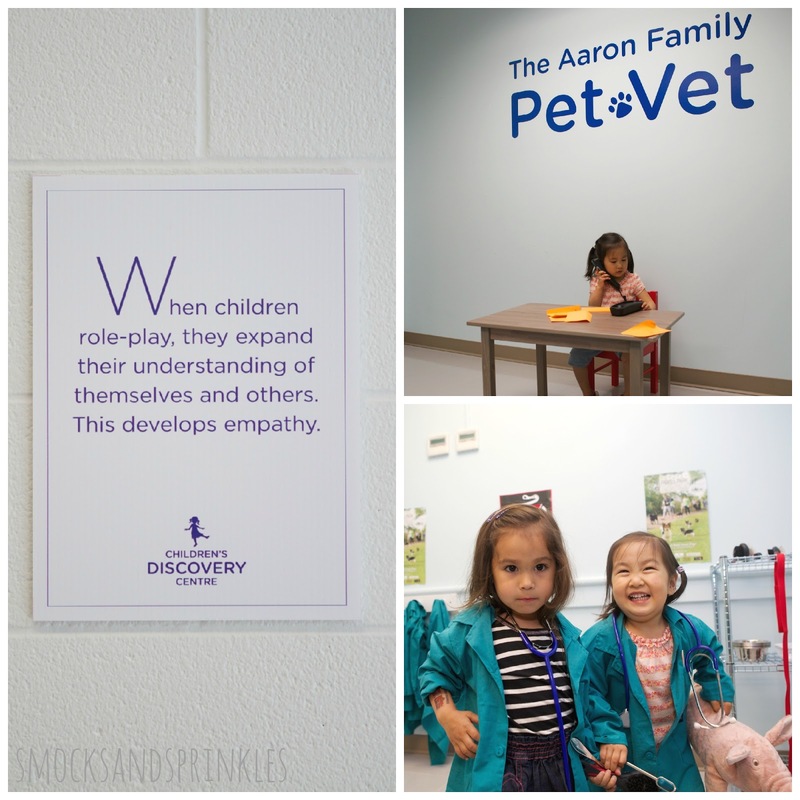 Basically, there are 10 different "discovery zones", each very obviously designed with so much care and thought. We...uh, I mean our kids beamed with excitement while exploring each discovery zone. 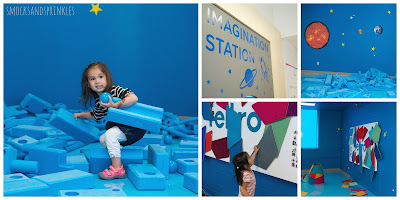 Imagination Station: Out of this world! Foam blocks and large magnetized felt tiles allow kids to create masterpieces in an outer space setting. You can even join the foam blocks together to create a track for balls to roll on. Luckily there is a poster with ideas on how to use the felt tiles in case you're not feeling particularly creative. 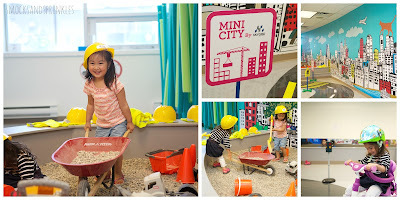 Sky Grid: From riding tricycles/wagons through the "city" streets to working right inside a construction zone (hard hats provided), the Sky Grid zone was definitely one of our favourites. We loved that the construction area was full of small rocks instead of sand. Sand always finds a way to make it home with us. It's kind of like glitter's annoying twin. Campground: Don't want to make the trek to Algonquin and brave nature with little wee ones? No problem (neither do we)! 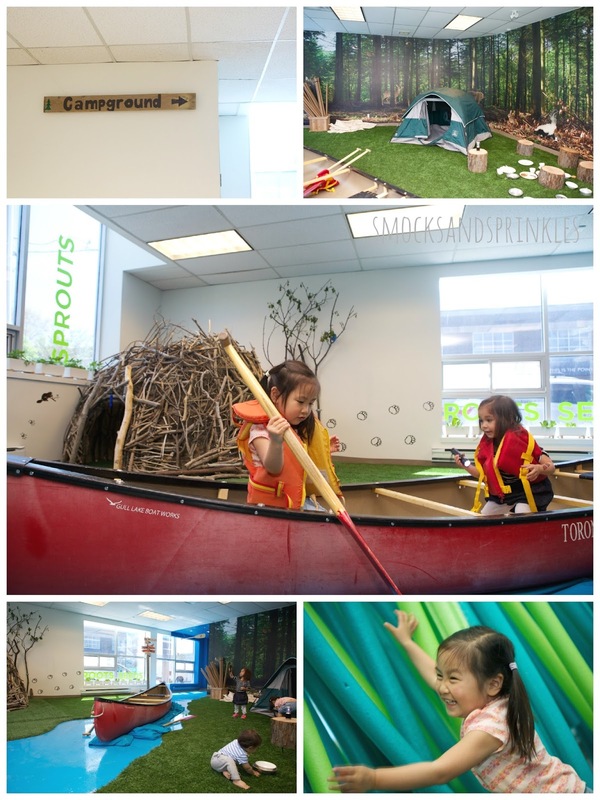 The campground zone allows your kids to experience camping without having to leave the city. You can even build your own tent if you're feeling super outdoorsy. Working flashlights and a camp ground complete with tree stumps to sit on and plates/utensils/play food made this zone extra fun. We also heard rumours that there is a fake campfire on the way. Art Hive: Your little Picassos will love this zone! And don't fret, smocks are provided and the paint is washable (it came right out of our clothes). 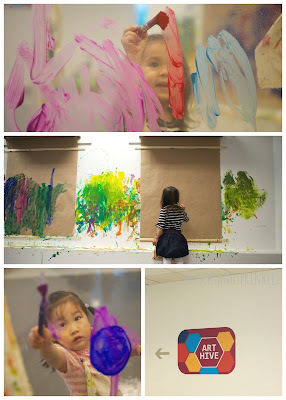 Our kids especially loved painting and squeegeeing the plexiglass panels. There is no such thing as being too messy in this zone. A clean up sink station is located right in the art hive...phew! Boom Room: Ready to make some noise? Kids are free to test out different instruments and learn how to make music from everyday objects (like baking pans). We loved the map showcasing instruments from around the world, and so did our kids! 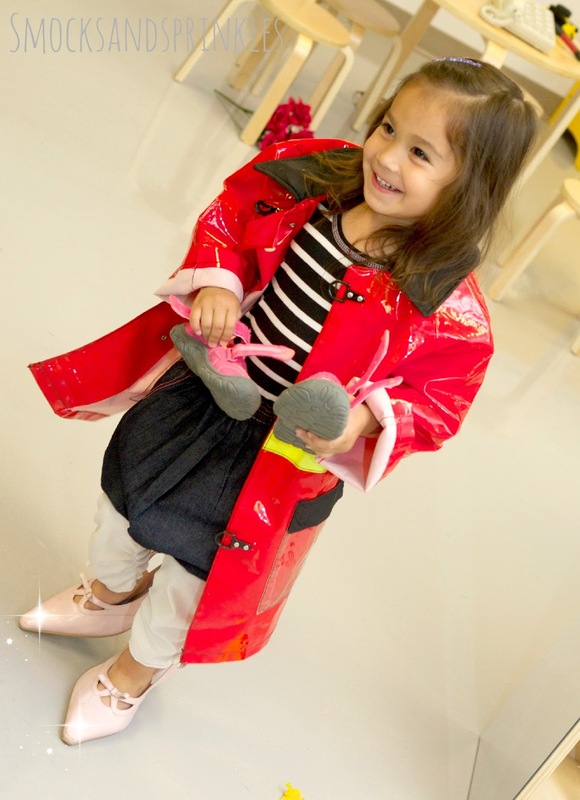 Make Believe: Ever seen a fire fighter in pink heels? You can be anything you want in the make believe zone. Tons of dress up gear and a stage to wow your audience. Our girls were thrilled with the shoe options. So many to choose from. 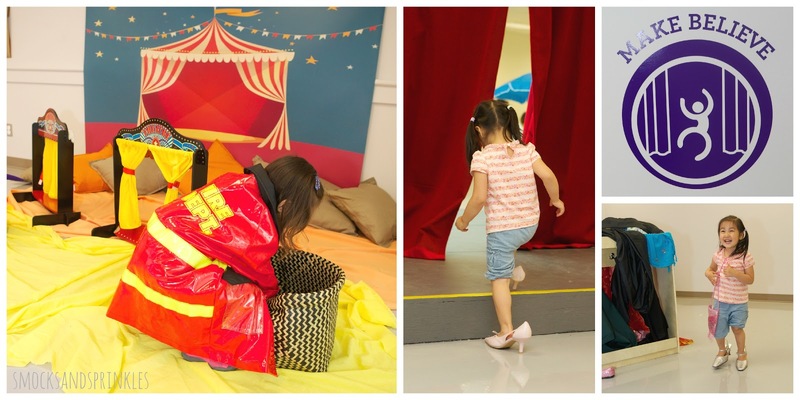 There's also a space to make your own puppets and perform your own puppet play! Pet Vet: Calling all wanna-be vets! 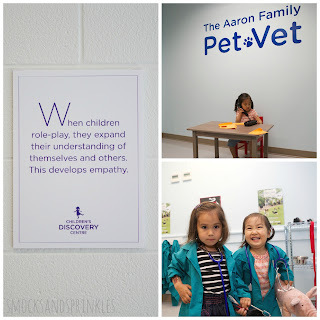 This zone allows you to be a veterinarian without all the years of schooling! 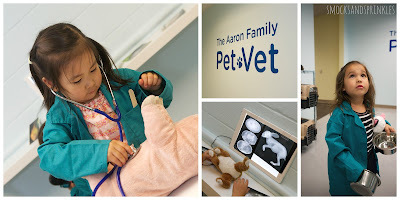 ;) Our kids loved pretending to be docs with the mini lab coats and stethoscopes. It's okay piggy, Dr. Kiyomi is here! Eat Street: A marketplace equipped with shopping carts and plenty of play kitchens made this zone a big hit with our kids. Now we know why toddlers aren't allowed to have credit cards. Yeeesh! Check out that overflowing shopping cart! 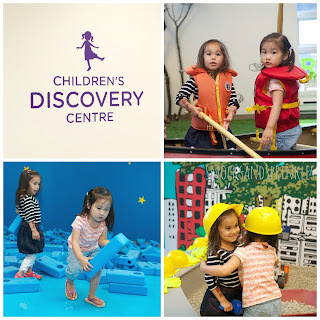 First Discoveries: The perfect place for the littlest visitors to explore. 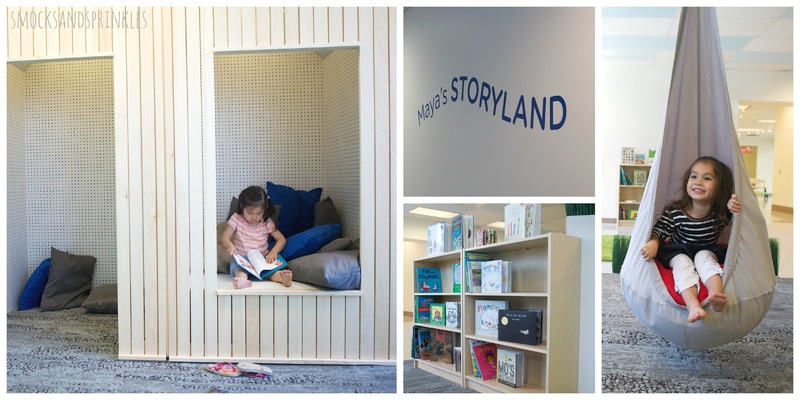 Definitely intended for babies, this space is padded for safe playing and loaded with fun toys and mirrors. 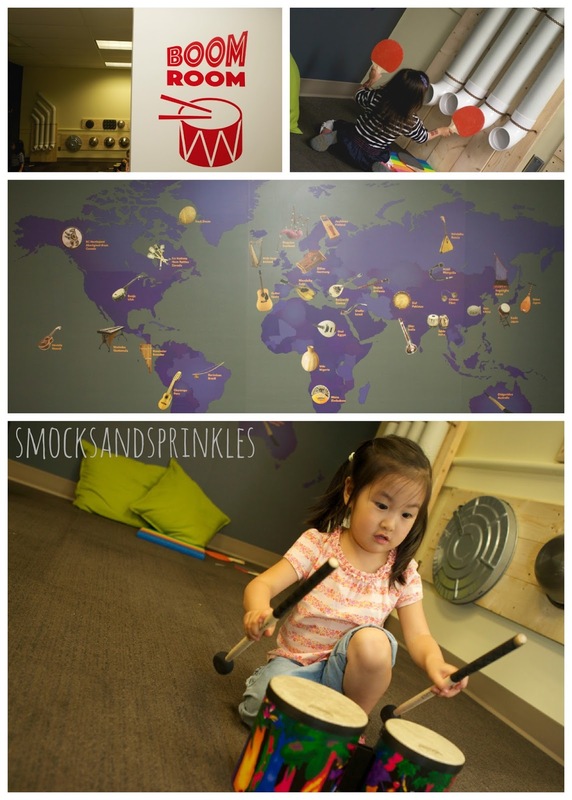 Sky Grid and Art Hive also have infant friendly sections to entertain babies and even toddlers. This is PERFECT if you have more than one kid. Baby can play happily in the contained section as your toddler or older child entertains themselves with other things close by. Win win! Staff: Probably the best thing about this place apart from the fun activities! The staff are so friendly, knowledgeable and hard-working. 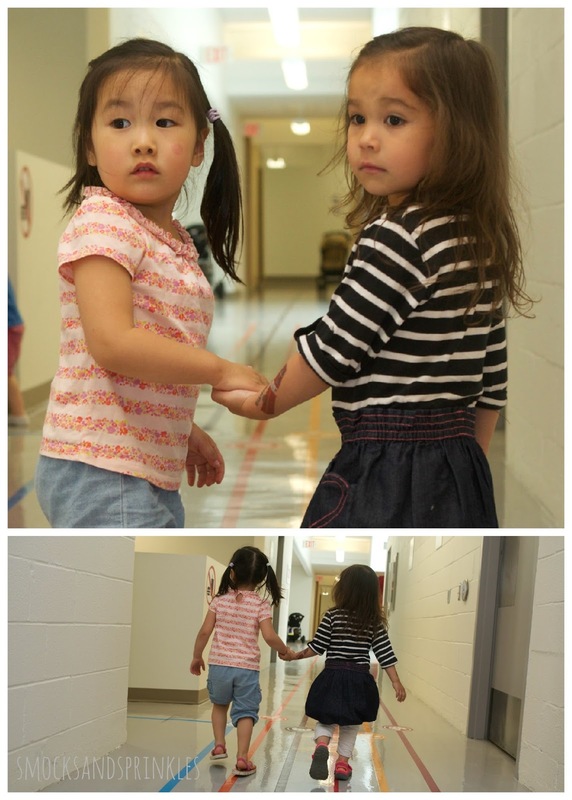 They interact with the kids at their level and keep the areas clean and organized. We didn't count, but it seemed like there were enough staff members so each area could have at least one person in it. Wish we could take some of them home with us! 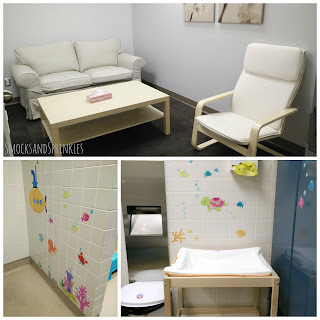 Washrooms: Clean, cute, with stools and change tables in both! The washrooms feature cute underwater decals and automatic faucets, and they're cleaned every hour. Be careful to check the door before you enter...I half-walked into the men's washroom! They provide small bags to dispose of your diapers, and while the change table is a bit small, it's well padded. Please note that I wasn't a creeper...no one else was in the washroom when I took the photo! 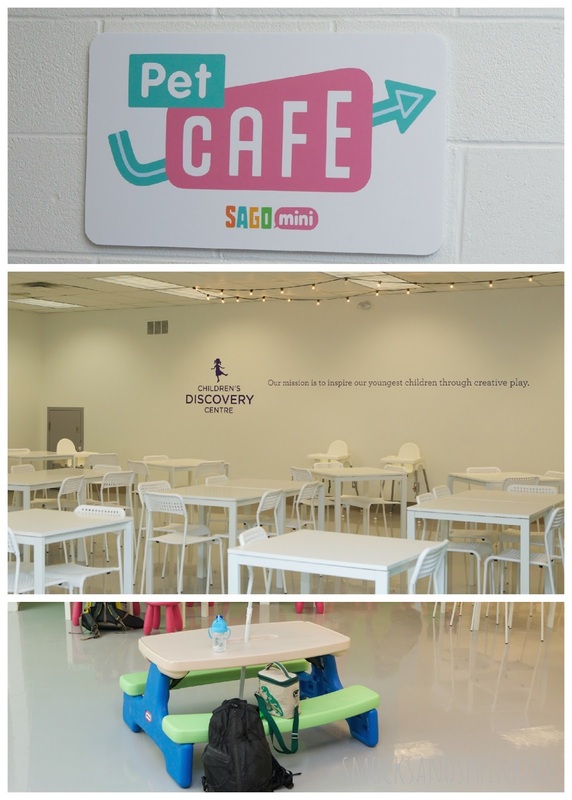 Breastfeeding room: There's a room in the Make Believe discovery zone with a small couch and chair for when you want to take a break (nap time, anyone? ), and it seemed like the most comfortable place to nurse. Otherwise, all of the infant play areas are padded for comfortable sitting-slash-feeding with the milk-makers. Parking: This worried us the most since this place is located downtown in the heart of Liberty Village. We went on a weekday afternoon and had no problem snagging FREE street parking close by. They even have a small parking lot for visitors with mobility issues. Storage: The easiest way to store your stuff is in your stroller (isn't that what we all use our strollers for in the mall? Stash your bags in the stroller, carry the baby?). 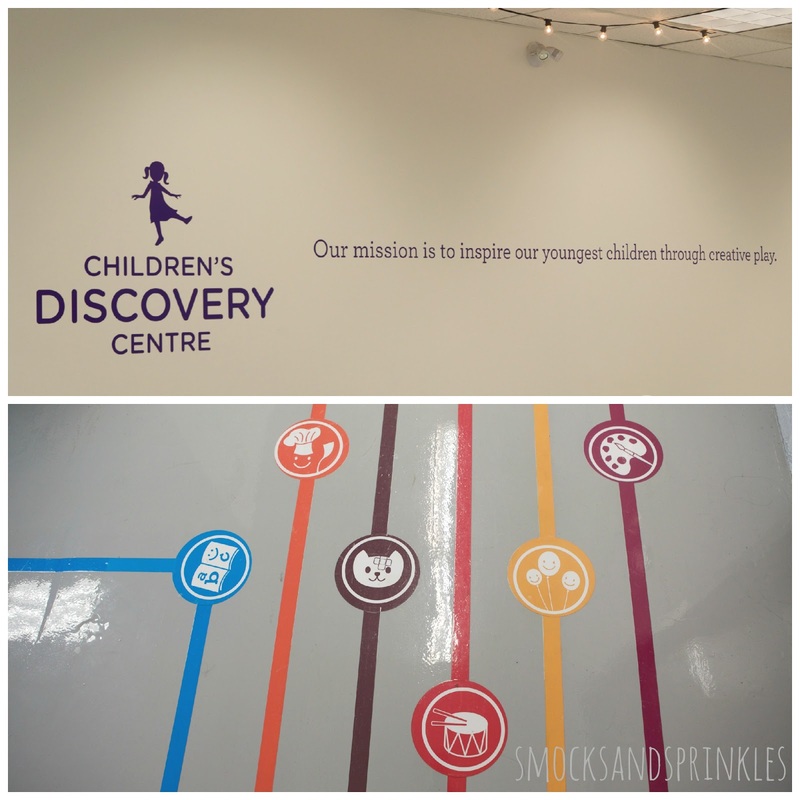 There are a few areas for stroller parking throughout the centre, and cubbies available behind the front desk. Don't bring your family jewels or anything, but the mommy code of honour seems to keep most things safe. Food: Bring your own! 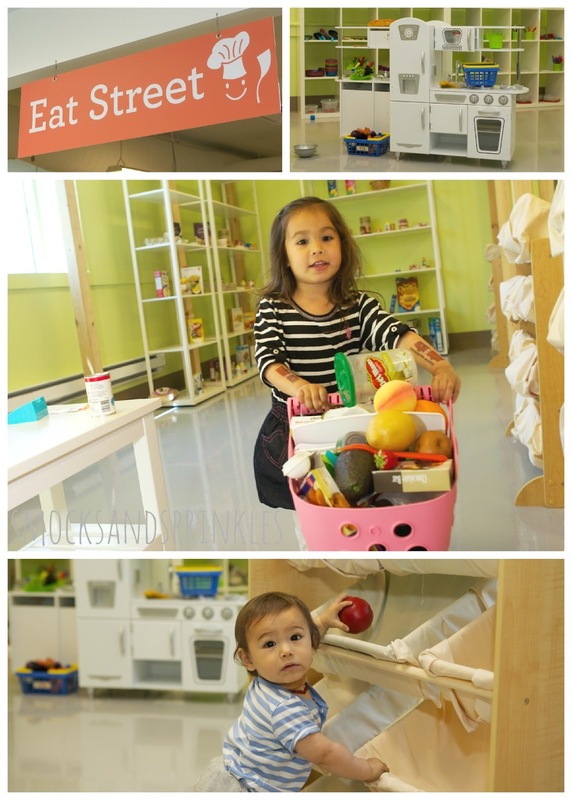 There's a clean, airy room with high chairs (and regular ones, yes) galore for when you get the munchies. We wish there were some small eats that we could purchase, but had packed our own snacks in case, so we're pleased to report that no one had a case of the hangries. Kids who are familiar with the Sago Mini apps will love the decor in the Pet Cafe. Microwave: Need to warm up some food or formula? There's a microwave available for use in the birthday party room. Re-entry: Stamp your hand and come on back! There's a small parkette across the way, and Pizza Nova and Second Cup up the street if you want to picnic or grab a bite to eat. The staff also suggested we could leave for nap time and then come back after. Cleanliness: All the materials and equipment were new when we visited, and the staff seemed to be cleaning everything really regularly. Cost: Alright so I'm sure you want to know the cost to get in. Thirteen bucks (plus tax) per person for a play day pass (adults and kids). Kids under 1 get in for free. Seems pricey but after experiencing it first hand, the price is soooo worth it. Check out the website for membership options. Tip! Planning on visiting more than once? Consider purchasing the package of 5 play day passes. Works out to $11(plus tax) for each play day pass. Kid friendly map on the floor to find your way to the different zones! There are 10 unique and creative zones. Poor attention span? No problem! When your kid gets bored with one zone you simply move onto the next. Bonus that everything is conveniently located on one level. No need to wait for elevators! This place is packed with a full demo kitchen and a nursing room (with comfy couches). You can literally hang out with your mama/dada friends around a kitchen island while your kids entertain themselves in the Eat Street zone. Complimentary bottled water! You and your kids will need plenty of water from all the gasping you will be doing as you react in amazement to your surroundings. Safety first! Helmets provided for ride-on toys. Kids' noggins fully protected while playing. Super friendly and helpful staff. One offered to help our kids build a tent in the campground zone. They weren't the least bit offended when our kids took off half way during the activity. Clean washrooms equipped with change tables. As a parent, a clean washroom where you actually don't feel totally disgusting dropping to your knees to assist a potty-training toddler is incredible. Large, designated eating area with plenty of seating including child-sized picnic tables. Forgot your socks? No biggie. 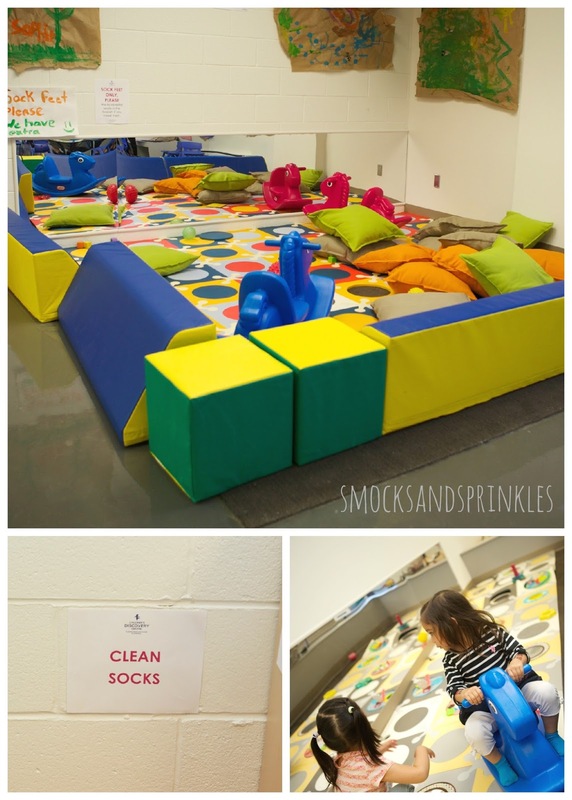 Clean socks provided for both adults and kids. Worried about germs? Leave goobered toys out on the ledges to have them cleaned and put back. Okay, had to add an eleventh reason. The pet vet section has a mini X-Ray machine where you can view X-rays of animals, like a cute little bunny. Gasping yet? Last reason, promise! With 2 children under the age of 3 (a 10 month old and a 3 year old), this place if perfect for entertaining both age groups. I actually found it RELAXING! Great review and post on the Children's Discovery Centre. Samantha, thanks so much for the compliment! Let us know if you have any requests for other blog posts or reviews.